During the W-2 and 1099 process for states, if your state reconciliation return has an amount due on the return, Aatrix will not be handling this payment. At this time, state payments are not supported during the W-2 and 1099 process. It will be the employers' responsibility to make this payment. Note: Payments can be made outside of the W-2 and 1099 process. Upon completion of the W-2 and 1099 process, navigate to the state from selection window within your payroll software. 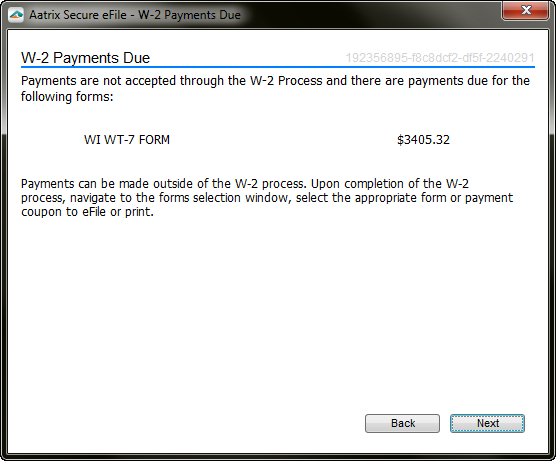 Select the appropriate form or payment coupon to eFile or print.